While reading a blog post or surfing through various pages, we find links to other pages. It takes time in Clicking on those links and see if it has something relevant. So, we want a way so that we can quickly know what the link contains without visiting to the website. For this, we can try HoverReader in Google Chrome. This simple Google Chrome extension lets us read the content of a link without clicking on the link. You only need to hover a link and you will see the content of the page in a floating window. Using HoverReader is quite simple. Just install the extension from Chrome Web Store and it will add an icon in the Omnibar. Clicking on this icon lets you manage the settings like font size and fine. 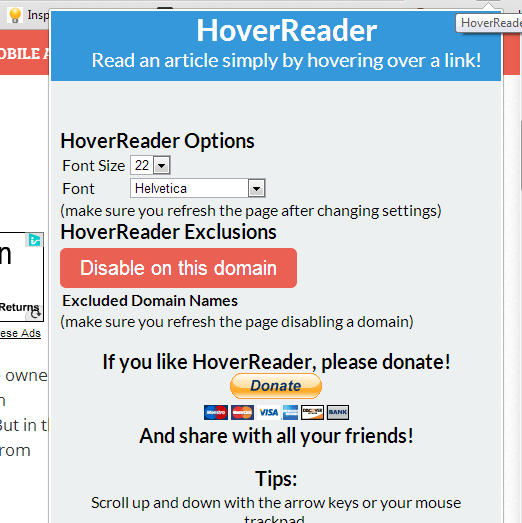 You can also disable the HoverReader on few selected websites. Just click on “Disable on this domain” button to disable it on the current website. This extension can help you in many ways. If you are searching for something, it can make your searching faster. You can quickly see the preview of links without visiting those websites. If you reading a blog post, it lets you read the related linked content without leaving the current blog post. Internally, this extension runs the readability engine on the target page. Thus it extracts only the relevant article while stripping the ads, graphics and other non-essential stuff. Thus it provides you only what you want to read. You can scroll inside the preview window with mouse to read the content. This window disappears as soon as you move mouse away from the window. Without this extension, you will end up with multiple tabs in the browser. I find this tool really helpful. You should also try this and share your views with us via comments.